Starring Eddie Redmayne, Katherine Waterston, Alison Sudol, Dan Fogler, Johnny Depp, Jude Law, Ezra Miller, Zoe Kravitz, William Nadylam, Callum Turner, Claudia Kim, Ingvar Sigurdsson, Ólafur Darri Ólafsson, David Sakurai, Brontis Jodorowsky, Kevin Guthrie, Victoria Yeates, Derek Riddell, Poppy Corby-Tuech, Cornell S. John, Alfie Simmons, Thea Lamb and Joshua Shea. 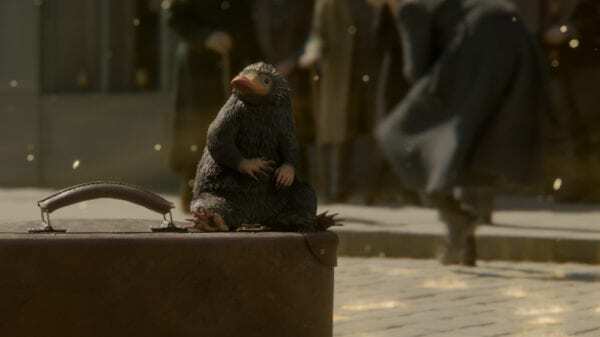 The second installment of the Fantastic Beasts series set in J.K. Rowling’s Wizarding World featuring the adventures of magizoologist Newt Scamander. In an effort to thwart the escaped Grindelwald’s plans of raising pure-blood wizards to rule over all non-magical beings, Albus Dumbledore enlists his former student Newt to help. Lines are drawn as love and loyalty are tested, even among the truest friends and family, in an increasingly divided wizarding world. While Fantastic Beasts and Where to Find Them was an interesting, if fairly flawed, look at the wizarding world decades before Harry Potter was even born, its sequel was largely anything but. The Crimes of Grindelwald falls on its ambition and scale that doesn’t live up to its potential. 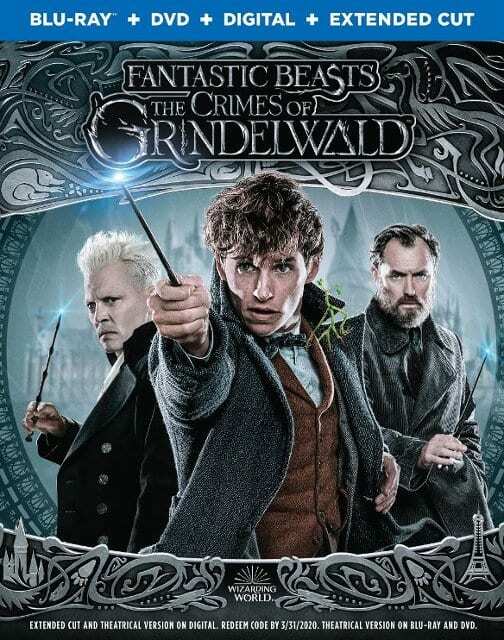 Its story lacks the emotional weight between most of the characters and the inclusion of Jude Law as a young Albus Dumbledore is not enough to liven the film. The blu-ray offers some interesting special features, but some shine a light more on the film’s problems rather be truly insightful into the film’s production. My original review of the film stands unchanged. While most of the cast, in particular Eddie Redmayne, Zoe Kravitz, Jude Law and Johnny Depp, give fairly good performances, they were not enough to improve the film’s quality. Part of the problem is many of the elements that worked in the first film are gone here as the principal cast spends so much of the film apart from each other. It is a long while before Newt, Tina and Jacob are all together in a scene while Alison Sudol’s Queenie spends much of the film separated from them. Law makes a pretty good Dumbeldore that’s a nice mixture of his humorous, wise and slightly Machiavellian personality. And unlike his cameo in the previous film Depp doesn’t ham it up as Grindelwald and is fairly soft-spoken and calm throughout the film which sometimes gives him an unsettling presence. Where the film doesn’t land, though, is in the story. It is a rather boring film as nothing really exciting happens between Grindelwald’s escape at the beginning and the climax (and even then the climax isn’t as ‘edge of your seat’ as much as it tries to be). The real crime (no pun intended) is just how meandering the plot is. Director David Yates and Rowling, who wrote the screenplay, try to make Crimes of Grindelwald a more complex film, even by the previous Harry Potter standards with quite a lot going on. The problem, however, is that there is too much going on as the film tries to blend mysterious prophecies, Creedence’s search for his family history, Queenie’s relationship problems and the Ministry’s distrust of Dumbledore all together neatly. One scene in particular is a pretty massive exposition dump as various characters relate their histories and roles in the film’s events, but by then the mysteries have been so jumbled it’s a bit hard to keep it straight. Character choices seem rather rushed, especially when it comes to Queenie and Credence during the film’s climax. Very little of the consequences seem earned and the film feels like set-up for the grand finale despite this being part two of a five-film series. Rowling discusses the inspiration for this story as well as the complex narrative of the film compared to the first one. Insight is also given to her partnership with Yates and producer David Heyman on how they wanted Fantastic Beasts to look and feel different to the Harry Potter series. Rowling also examines the relationship between Dumbledore and Grindelwald and the conflicting emotions Dumbledore might feel towards his first love. Ezra Miller and Harry Potter‘s Evanna Lynch (Luna Lovegood) meet to discuss their connection to the Potter franchise. Its a fairly adorable look at how geeky they are, especially since they both began as fans of the series before joining. Lynch talks about how funny and creepy it was that she already knew so many details about the lives of the various cast members due to her love of the films. Most of the feature, though, is them sitting through scenes of Crimes of Grindelwald and Miller taking Lynch through some of the stories behind the film, its memorable moments and what it means to the franchise’s saga at large. It really helps make Miller and Lynch relatable since they geek out just as much as the fans do when talking about their love of Harry Potter. 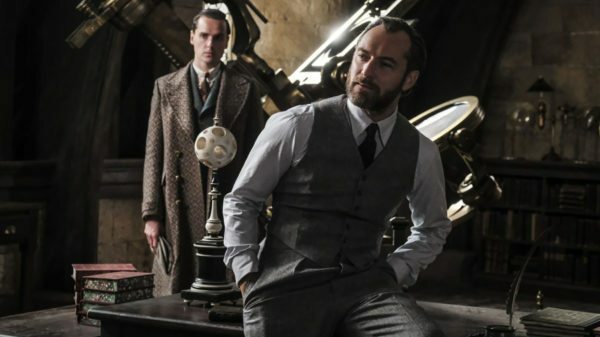 Jude Law and J.K. Rowling give their thoughts on his casting as a young Dumbledore and what sets him apart from Richard Harris and Michael Gambon’s previous portrayals while also making him similar to them. Law has some good insight into the character and makes an interesting observation that Newt is the only character to really call out Dumbledore on his shadiness. There’s also a bit more discussion about his relationship with Grindelwald, but nothing new that hasn’t already been covered yet. The feature also takes a look at Dumbledore’s costume design and the snazzy suits he wears as opposed to the long colourful robes he’s known for in Harry Potter. A collection of behind-the-scenes looks at some of the film’s big moments. Whether its the return to Hogwarts, the creation of the circus or the French Ministry of Magic, there is some nice insight into how the film was created and the work that went into the effects. The fact that these features combined almost total one hour is nice for any fan interested in how it was made. There’s several deleted scenes that total around 14 minutes, but for many of them its pretty easy to see why they were cut. Several of the scenes don’t really add anything to the film beyond some extra exchanges between characters. The only ones to add anything of value is with Newt and Dumbledore, where a fairly major revelation is made that adds so much context to the actual film, Leta at a fancy ball where rumours about her brother are swirling and a quiet moment between Credence and Nagini. While these deleted scenes wouldn’t have done much to improve the film overall, they still would have added a little more depth to the story and character development seen. Include also is an extended cut of the film that is only available on the digital format. The extended cut restores the scenes mentioned above as well as an alternate opening depicting how Creedence survived the events of the first film. Fantastic Beasts: The Crimes of Grindelwald doesn’t live up to its own potential and ambition. The story has some major pacing problems as well as just being too complex for its own good. There are interesting ideas present, but they don’t get the right amount of time to breathe as Yates and Rowling juggle too much to make it a fully cohesive story. The cast does well with what they have for the most part, but even they can’t do much to uplift the film. Fans of Harry Potter might enjoy the making of the film, but will likely have problems with this chapter of the lore.